I've been thinking that I want to do more to help with the efforts in Japan. I'm not remotely athletic, so physical feats like doing a sponsored run are out of the question. I don't really bake, so I don't want to provide paltry efforts for the wonderful Cakes for Japan. I've not really got the time to auction stuff on eBay for the brilliant Bento4Japan campaign, much as I would like to take part. 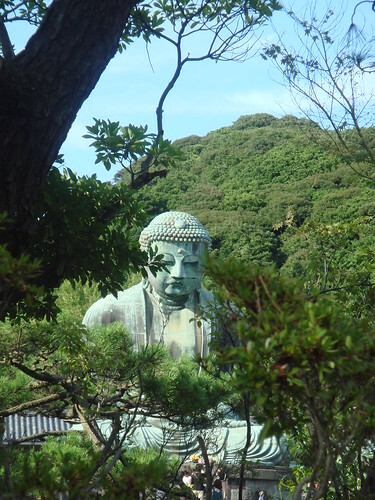 Then I realised that I had lots of rather nice photos that I'd taken in Japan which languished in this weird half-life on Flickr, as I'd never got round to printing them out. So I thought to myself, "I really like tote bags and I reckon others do - let's use those photos to make some bags for Japan". I played around with all the designs to make them a bit funkier, and I'm pretty pleased with how they came out. The bags are only £8 each and all proceeds will go directly to the Japanese Red Cross (that's £1.10 per bag). And there's free shipping till 31 March with the code HELP4JP. And if you don't fancy buying a bag, you can donate to the British Red Cross using the links below. At the end of my first year at university, I began to get very ill. I felt exhausted but hyperactive, I sweated all the time, I had panic attacks and my hair fell out, I had chronic stomach upsets, I kept losing weight no matter how much I ate, and I even had the occasional black-out. What I found hardest to cope with were the palpitations and tremors - I couldn't even hold a pen without trembling, and I could constantly hear my heart beat. And if I lay flat on the floor, I could see the blood pumping through my aorta in my stomach as I'd got so thin. God knows why. but I didn't tell my parents what was going on. But when I developed a goitre and weird, bulging eyes, they worked out that I had Graves' disease - a hereditary illness, which my mother had also suffered from. Graves' disease is an autoimmune disorder where the thyroid gland goes into overdrive; the thyroid gland controls metabolism, so basically it was as if I was on speed. Thankfully, there was a treatment - an anti-thyroid drug called carbimazole, plus a course of beta-blockers to stop my heart racing. I was warned however that the carbimazole had a (rare) side-effect of bone marrow suppression, and so if I ever got an infection, especially a sore throat, I'd have to report it immediately to have my white blood cell count checked. I get a lot of sore throats. I'd also have to have my blood screened every month anyway to check that the drugs were working and that my thyroid hormone levels were stabilising. From then on, my life was spent going in and out of hospital, being punctured for blood samples - the insides of my elbows were perpetually bruised and I looked like a junkie. 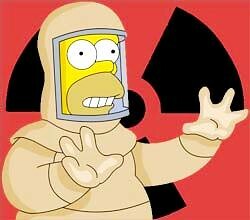 You're probably wondering why I'm telling you all this - I mean, what's this got to do with radiation poisoning? Well, unfortunately, the drug treatment didn't work, and after three years I was told I had to come off the carbimazole, as for obvious reasons it wasn't a long-term solution. The only options I had now was a thyroidectomy or radioiodine treatment. A phobia about having my throat slit meant the thyroidectomy was out of the question. Moreover my grandpa, another Graves' sufferer, had had the operation, and it had left him with a necklace-shaped scar which I really didn't want. So I went for the radioiodine. I'd read the leaflet - it was just a drink and seemed harmless enough. My parents took me to the hospital, where a nurse told me to go to a secure wing. I opened the door and noticed there were nuclear symbols everywhere (like the one pictured at the top) and suddenly I felt very afraid. The only people I could see were technicians wearing full-body protective outfits, like the ones they wear at the end of ET. I didn't know whether to laugh or cry, but began to feel slightly hysterical. One of them came up to me, took my form with my details out of my hand, and asked me to wait in a small room. I sat there in my jeans and my top, feeling woefully underdressed and horribly alone. The technician came back after ten long minutes and then handed me an innocuous-looking little bottle with a straw sticking out of it. It was one of those white bottles you have in Chemistry class to dispense drops of distilled water. Again I wanted to laugh. She told me to drink it all down. I drank it - it tasted of nothing. She then told me to go home and to shower thoroughly and wash my clothes as soon as I got in, and that was that. I got home, I did as I was told. I was ill for a week - flu-like symptoms - which I had been warned about and so was prepared for. What I hadn't reckoned on was feeling like a pariah. 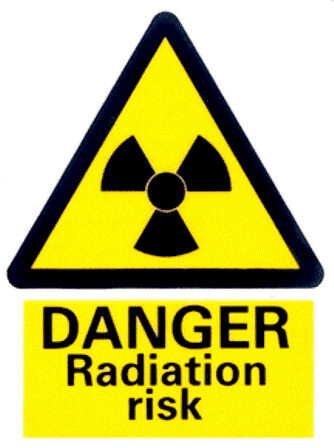 After radioiodine treatment, you emit radiation from your neck for at least a week, so you can't go near any other humans in case you poison them too - the young, the old, and the pregnant being particularly susceptible to radiation poisoning. I had to take a week off lawschool and became a complete hermit for that period, which had the added effect of making me terribly lonely, as well as a radioactive outcast. So, I guess what I'm trying to say is that my minor experience of radiation was pretty frightening. However, and this is the important bit, it was entirely voluntary. I keep thinking of the people in Japan, and how if anything should happen to them because of the situation in Fukushima right now, it wasn't their choice. 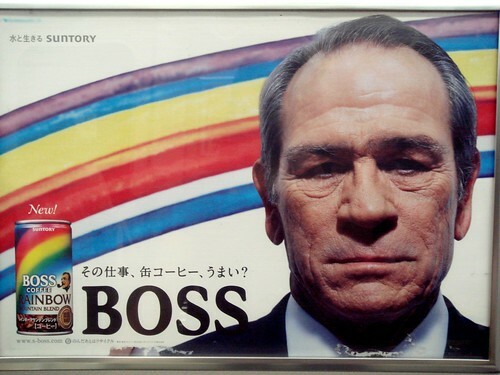 In Japan, there is a popular canned coffee brand made by Suntory called BOSS. You can get it in vending machines and convenience stores pretty much everywhere - the former will dispense both hot and cold versions. 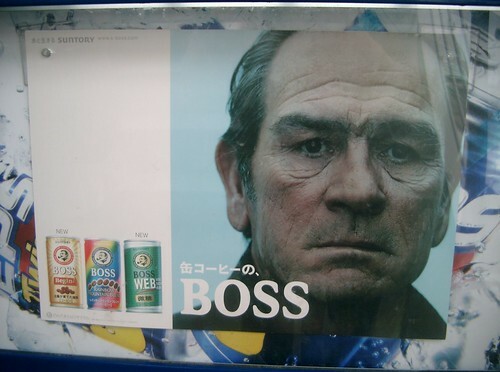 In the same unlikely way that Bill Murray was the (fictional) ambassador for Suntory's Hibiki Whiskey, Tommy Lee Jones is the (all too real) face of Suntory's BOSS Coffee. 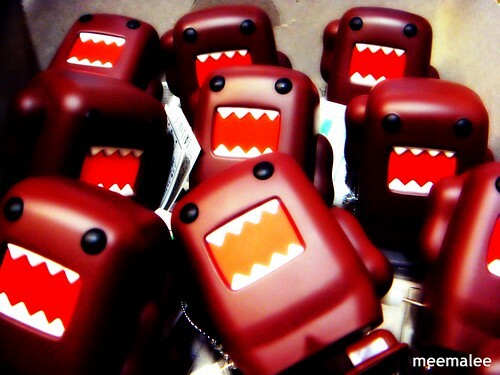 Apparently, these are known as japanders. 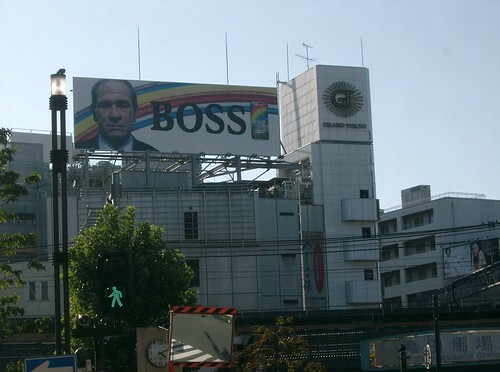 I've been to Japan three times now, and it's got to the point where it doesn't feel like I've arrived properly if I don't catch a glimpse of his craggy features on a billboard somewhere. 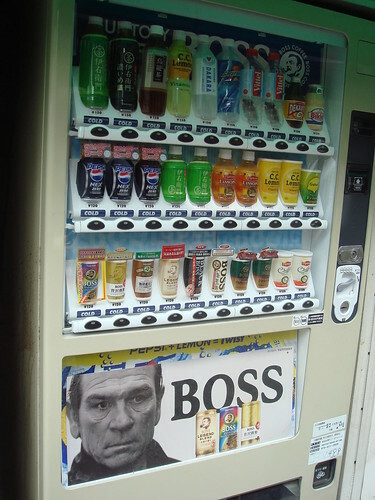 I'd be in a village on the outskirts of Osaka, where life seems as rural as can be, and I'd suddenly turn the corner, and there he would be - on a vending machine, looking stalwart and true. "Emil clung to my thigh for the first few minutes until it became apparent that the crowd was remarkably well-ordered, its streams of commuters, shoppers and fun-seekers avoiding each other through the use of some kind of sonar, flowing in calm streams towards their destinations. 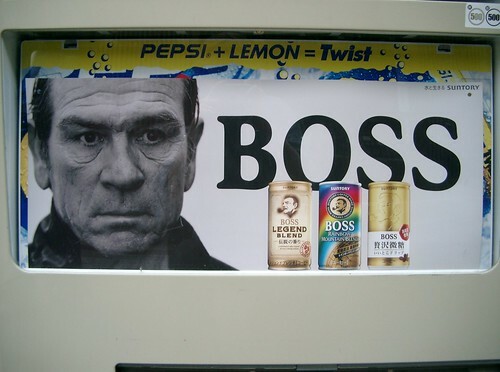 Meanwhile, above us, a cliff face of liquid crystal broadcast the incongrous face of Tommy Lee Jones enjoying a canned coffee drink in alarmingly grizzled detail". And back in England, whenever we see TLJ on the telly, my husband and I will sigh and say "Aww, that takes us back to Japan". 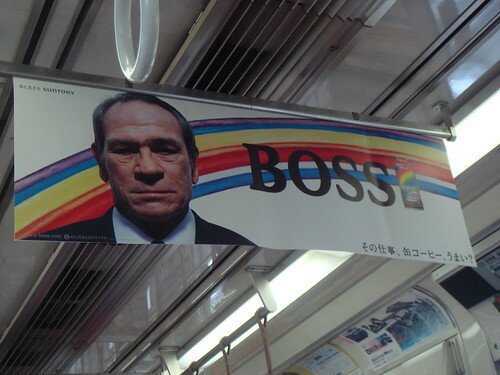 I don't know if he's still used to advertise Boss coffee, but I do hope so, and I'm looking forward to finding out. NOTE: I will be writing a few posts about Japan over the next month or so. I've called it the Natsukashii Series, because natsukashii is a Japanese adjective to describe something that triggers a fond memory - it's explained much better here. Now, you all know I like bentos, but my first introduction to the world of compartmentalised cuisine was the humble steel tiffin carrier - the school/office lunchbox and preferred picnic basket of all Burmese people. As a child, there was little I loved more than deconstructing a tower of edible treats and digging into each part - fluffy rice in one section, fried chicken in another, and crunchy salad in the last. Keeping the foods separate meant that the leaves didn't go limp, the chicken stayed crisp, and the rice stayed pristine till it was time to tuck in. 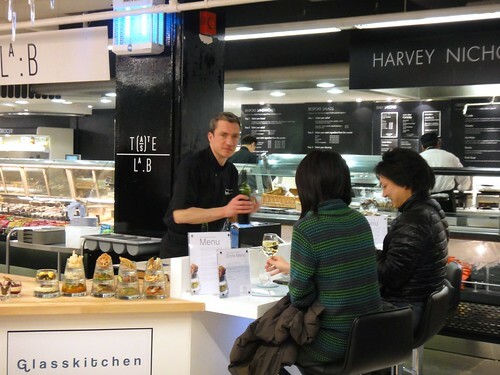 So when I was invited to visit the Glass Kitchen, a pop-up at Harvey Nicks, and found out that it was devoted to a similar concept, I couldn't resist dropping by. The Glass Kitchen is a ten seat tasting bar run by traiteur chef Franck Pontais, winner of Iron Chef UK, caterer to the stars (he did Stella Mccartney's wedding), and owner of Food Creation, a food consultancy company. The dishes he serves up come from his 2008 book Terrines and Verrines which provides recipes for both of these very French foods. Everyone knows what a terrine is, although what you might not know is that it's named after the earthenware dish in which it should traditionally made (compare casserole). Verrines on the other hand were unfamiliar to me, but my A-Level French meant I suspected they had something to do with glass. 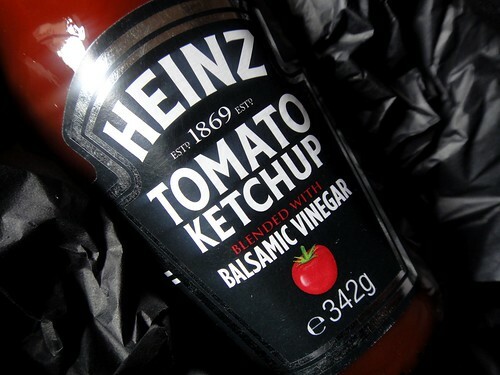 And indeed verrines are layered food in a glass, a traditional way of eating in France which was introduced to the US ten years ago by Joel Robuchon, but which has been fairly unknown in this country until now. The traditional verrine glass is small, rounded and squat, but since (like tiffin carriers) the aim is to keep the individual parts fresh until they're eaten, the new wave of verrines come in separate sections - a new take on modular meals. 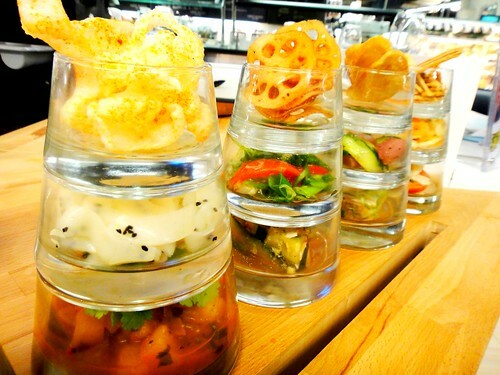 And unlike tiffin carriers, the stackable verrine glasses are transparent so you can see every beautiful level instantly. 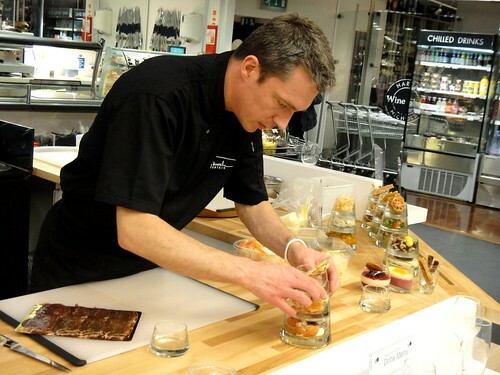 The savoury options on offer at the Glass Kitchen have as their main elements duck, smoked mackerel and salmon, carpaccio of beef, and Morrocan vegetable chorba, but on top of these bases are built two further tiers of, for example, parmesan parfait, and garlic, fennel and oak leaf salad. 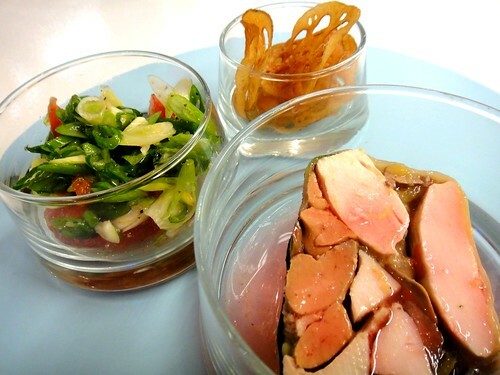 I chose terrine of poached chicken in cardamom and seared chicken liver, plum fruit and spring onion, salad with steamed ginger, topped with crisp of lotus root which was made there and then for me by Franck. He explained to me that everything is prepared on-site fresh that morning or the night before (except the smoked meats and fishes for obvious reasons) so when it comes to serving up, it's just a case of constructing from mise en place. This is the traditional traiteur way. And moments later, I was presented with a tiered glass tower which looked stunning. Of course, as they say, looks aren't everything, but when I carefully unstacked the rainbow of verrines and dived in, it was wonderful - the flavours were well-balanced, fresh and exciting, which is especially impressive considering that this was a cold dish. I particularly loved the seared chicken liver, which was beautifully seasoned and had just the right amount of give. Franck explained to me that the most important thing is to have a variety of textures and flavours so eating is as fun as the presentation, and this was spot on. For pudding, I chose pomegranate in rose water jelly, white chocolate mousse and cherry confit, black forest fudge and muscovado tuille biscuit. Again, Franck prepared it for me to order. This came in the traditional verrine glass, like a small goldfish bowl so although not as playful as the tower, it was still very pretty. 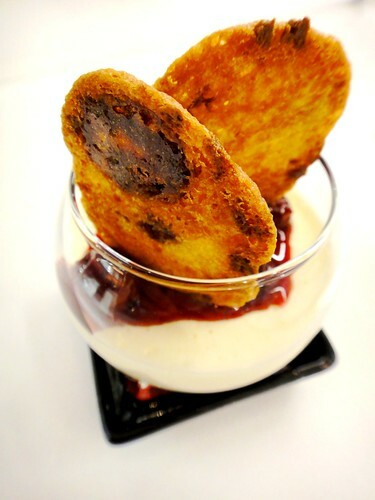 The different textures worked very well together - the crumbly fudge, brittle biscuit and soothing mousse and jelly. I wasn't quite as blown over as I was by the chicken, but this may be because I'm a savoury girl at heart. Otherwise I'm pretty much won over by the Glass Kitchen. The only criticism I have is that you're given a knife and fork for the savoury dishes, which is awkward when the mouths of the verrine glasses aren't huge and can lead to much scraping and clanging against glass (which I find a bit painful). It would make much more sense if spoons or just forks were offered, or even some slender chopsticks which are perfect for this kind of "hunt and peck" dainty dining. 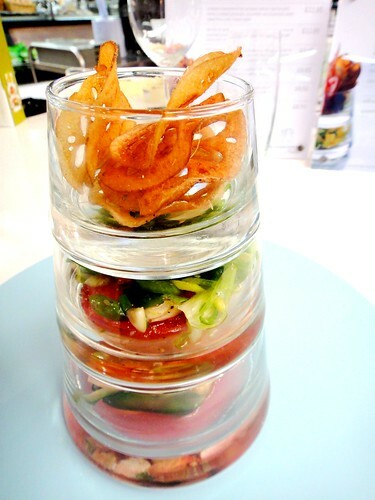 The verrine glasses are very cool though, and a tiered set of three is £20 which is fairly reasonable. You can also buy each section separately as well as other shapes and sizes. 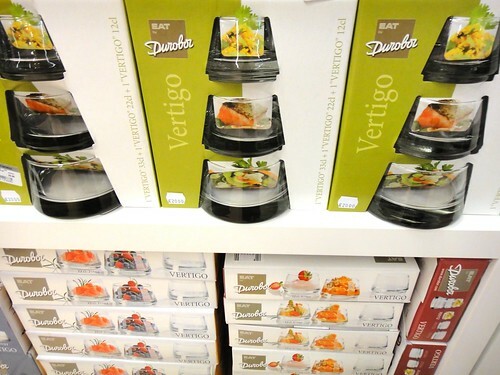 They're made by Durobor and as the name suggests they're pretty tough and can be stuck in the microwave or dishwasher. 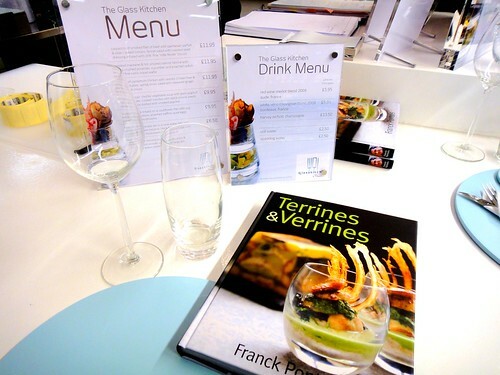 Of course, you don't have to fork out on specialist tableware to indulge in Franck's food at home - I should think that the recipes in his book can be recreated regardless (although don't tell him I said that). Signed copies of "Terrines and Verrines" are also available. Franck Pontais and team will be at the Glass Kitchen, Fifth Floor, Harvey Nicks until 10th April, from 11 to 8, Monday to Saturday and 12 to 6 on Sundays. It's drop-in only, so you can swing by at lunch or after work without having to book. 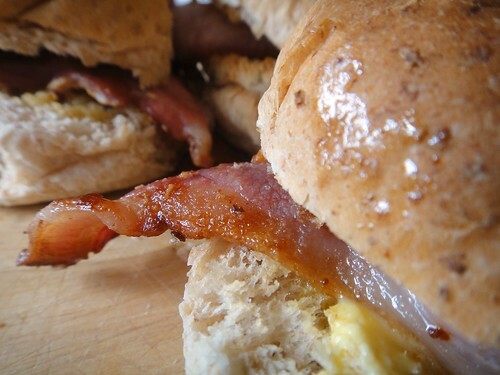 There's also takeaway available, and you can buy the smoked meats and fish that he uses. 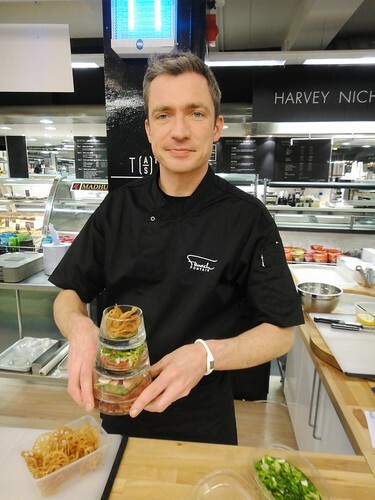 If you'd like to learn how to make verrines yourself, Franck is also hosting workshops from 6-8pm on 16 and 23 March. 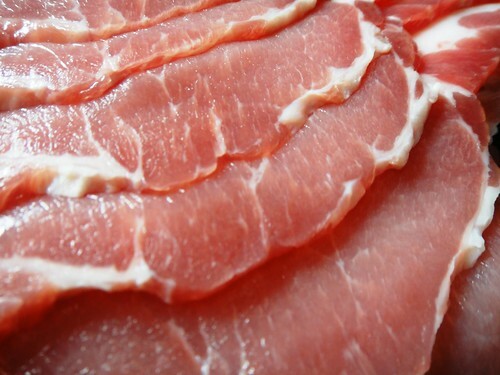 Places cost £60, inc tasting menu, glass of wine, and signed copy of "Terrines and Verrines". To book, call 020 7201 8689 or 020 7201 8632, quoting ‘Glass Kitchen Workshop’. It's March, but it feels like the depths of winter. All I want to do is fill my belly with hot soups and stews in a bid to stay warm. A double whammy of chilli heat and steaming broth is guaranteed to keep the chills away and one of my weapons of choice is the Korean dish sundubu jjigae aka soondubu jjigae. 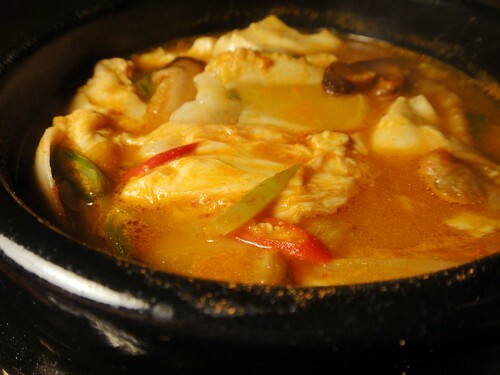 Sundubu jjigae is a hot and spicy stew (jjigae) made with super-soft uncurdled tofu (dubu), seafood, mushrooms, onions, kombu (kelp) and gochujang (a Korean savoury chilli pepper paste). 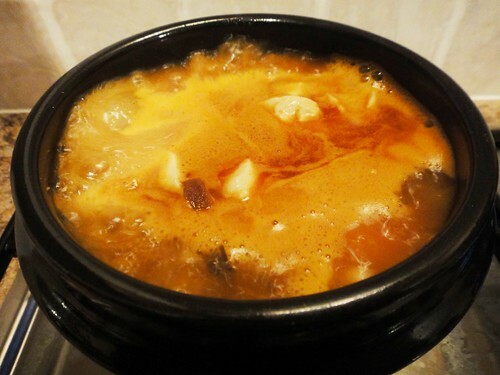 Made in a special earthenware bowl called a ddukbaegi which can be heated directly on a stovetop, a raw egg is cracked straight into the jjigae just before it's time to eat, and then the jjigae is served in the same bowl while it's still bubbling away. The combination of barely poached egg and cloud-like tofu dancing together in the intense broth is obscenely good, especially when you break into the egg and the soft golden yolk melds with it all. I'm addicted. Jjigaes can also be made in a normal saucepan and decanted into bowls, but this isn't half as exciting, since you don't get that cauldron effect. Jjigaes always come with a bowl of white rice and little side dishes called banchan - out of laziness I often just serve kimchi. Usually eaten with a long metal spoon and metal chopsticks, I find myself abandoning the latter so I can spoon more of the spicy jjigae broth onto the rice and into my mouth. I got my ddukbaegi bowls and all the other Korean ingredients from the Centerpoint Food Store off Tottenham Court Road. 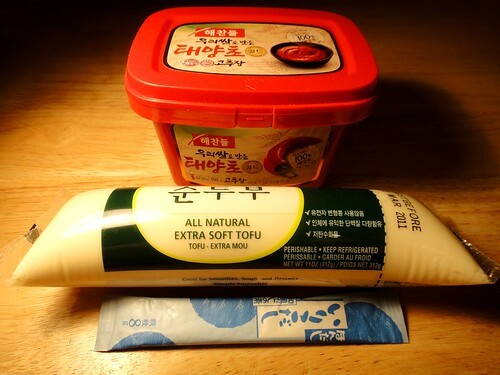 You can also get everything in the Korean stores in New Malden. Slice the mushrooms and cut the onion in half. Remove the heads from the anchovies. Sliver the spring onions and the chilli. 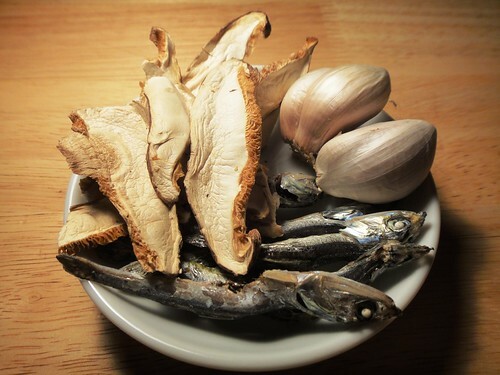 Place the kombu, mushrooms, garlic, onion and anchovies in a saucepan and add 500 ml cold water. 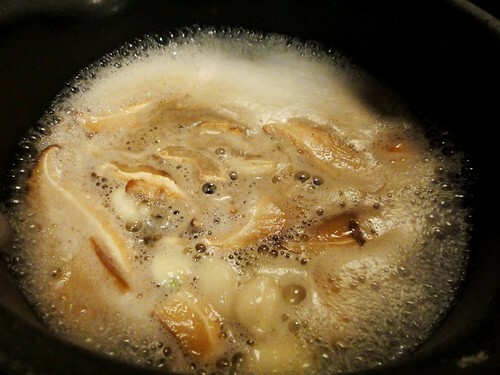 Bring to a vigorous boil and then simmer for 15 minutes to make your jjigae stock. 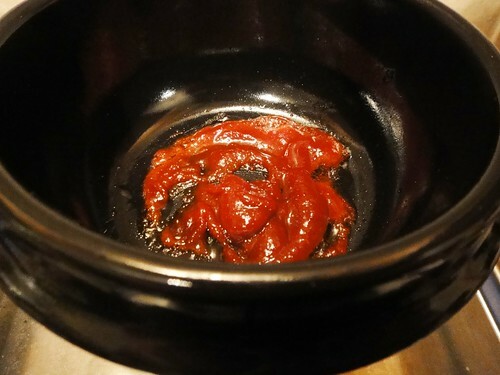 Add a tbsp of gochujang and a tbsp of oil to each bowl and place them on the stove OR add the gochujang and oil to a saucepan. Heat till it sizzles. Pour the simmering stock into the bowls/saucepan of sizzling gochujang (don't bother straining - the softened garlic and mushrooms etc are part of the stew). Top up with water if necessary and then bring to the boil. Add the seafood to the bowls/saucepan. This will cool the jjigae down, so bring to the boil again. Add the extra soft tofu and break up into clumps. Add the slivered spring onions and chilli and stir. Have the rice and banchan or kimchi ready for serving. 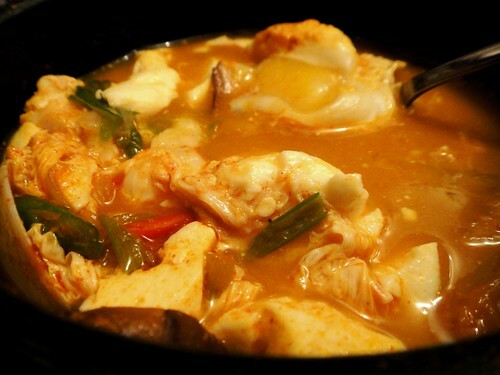 Bring the jjigae to the boil one more time and crack in the eggs. If using the bowls, immediately remove from the heat with oven gloves. If using the saucepan, immediately decant into (warmed) serving bowls. 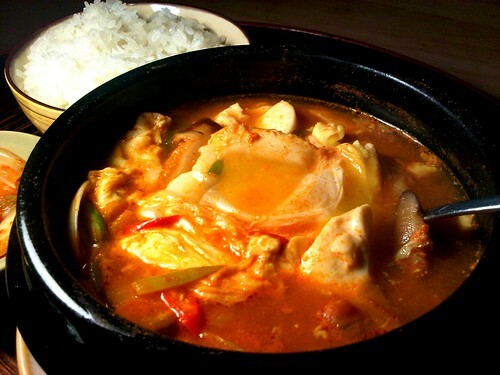 Eat the jjigae while it's still bubbling like the fiery depths of Hell and try very hard not to burn your mouth.